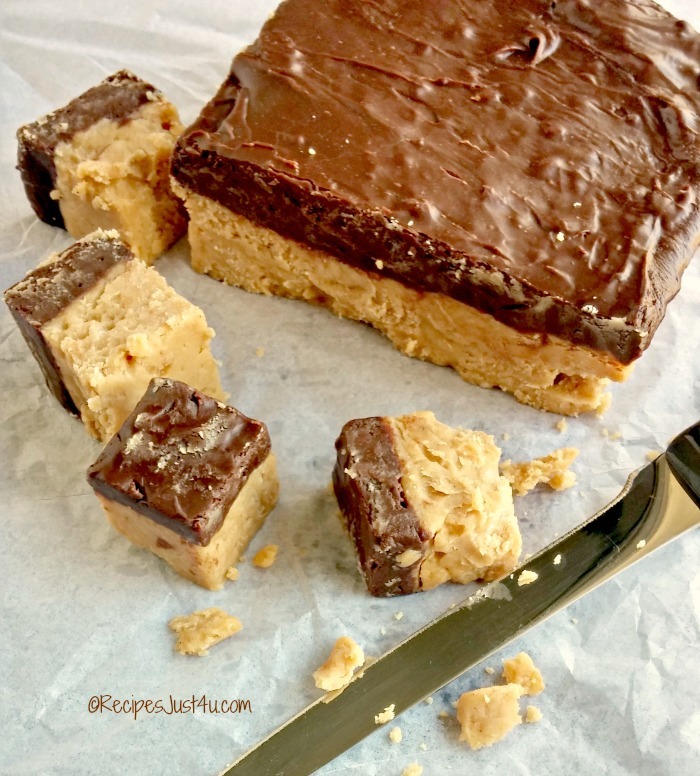 This tasty buckeye fudge is a wonderful mix of peanut butter fudge with a rich chocolate layer. 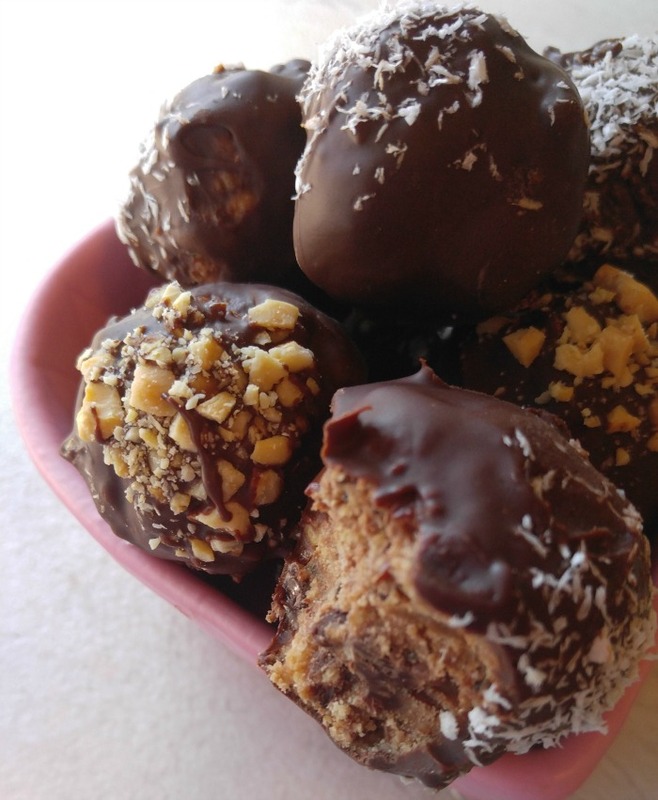 It has all the flavor of Buckeye balls but is so much easier to make. 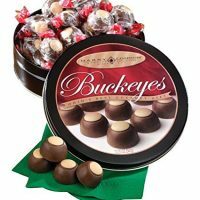 One holiday sweet treat that seems to appear every year about this time is a buckeye ball. This traditional favorite is a taste-alike Reese’s peanut buttery goodness confectionery that features a yummy peanut butter center dipped in chocolate. Buckeye candy can feature a pure peanut butter center, or have other ingredients, but the main idea is peanut butter surrounded by chocolate. 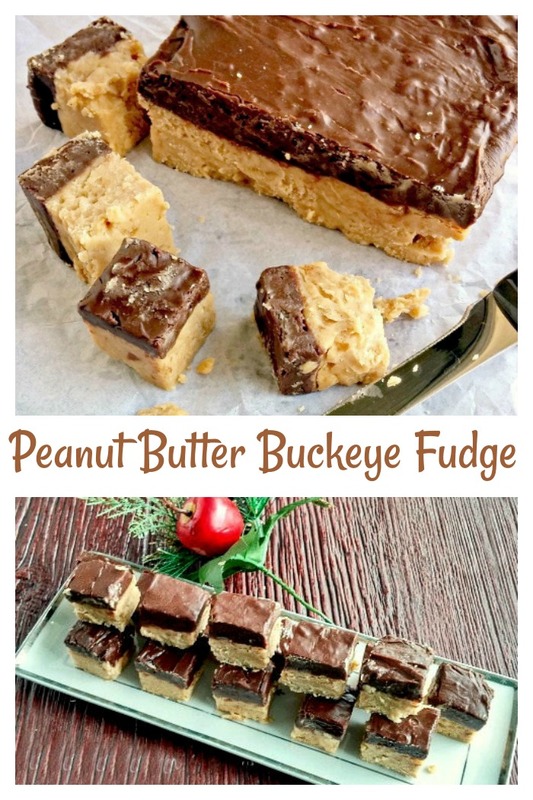 The buckeye recipe is a decadent, delicious and holiday comfort food all rolled into one delicious bundle. The problem with them us that they are labor intensive. And time in the kitchen is not something I have a lot of this time of the year. Don’t get me wrong, I love peanut butter chocolate Buckeye balls as much as the next person, but rolling all those little balls, dipping them in chocolate, letting them set, adding some decorations and on and on? No thanks…not this time of the year at least. 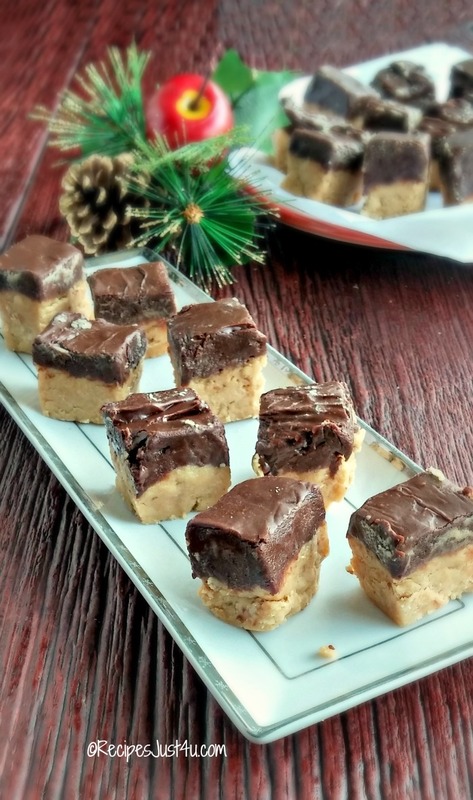 Instead of making the traditional peanut butter balls, get the same flavor with this buckeye fudge recipe in far less time. 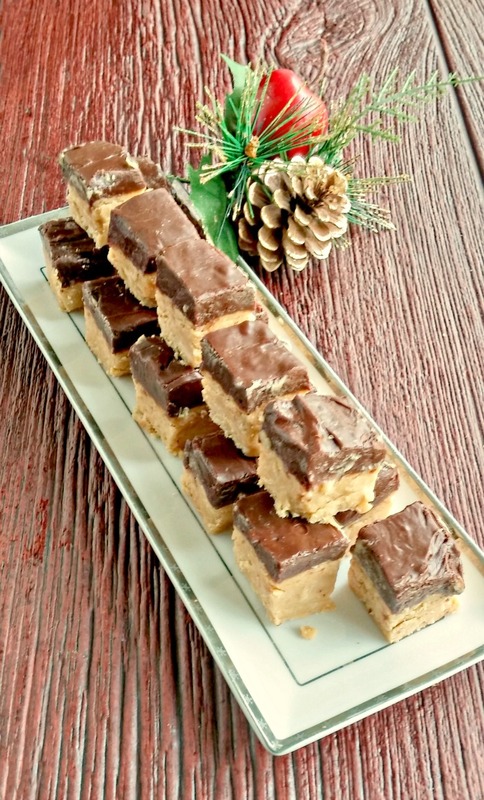 This buckeye fudge has all the flavor of traditional buckeye balls, but hardly any of the work. With a headline like that, what is not to like? Peanut butter √…Chocolate √…easy √ …fudge √√. Seriously guys. This is the easiest fudge recipes I have ever made! Today’s batch was made in about 10 minutes (not counting the setting time) and it came out perfectly. I heated it in the microwave to save time too. It can also be done on top of the stove, but takes a bit longer I’m all about saving time this month. Look at all these goodies for these peanut butter buckeyes. 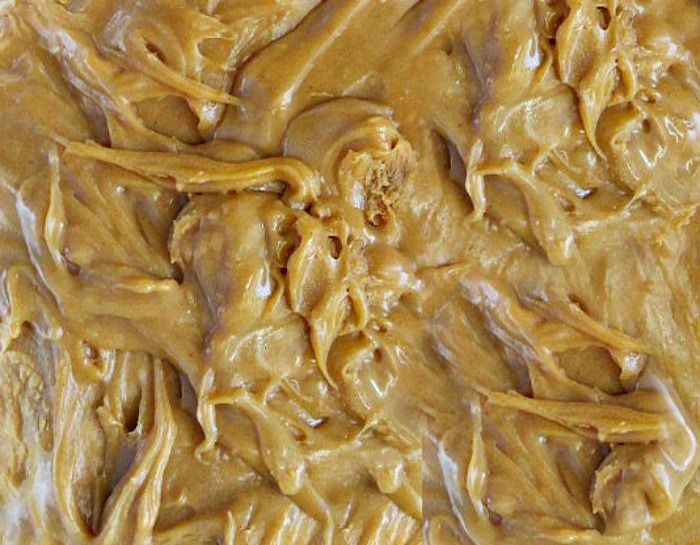 How can this easy buckeye fudge not be perfect? 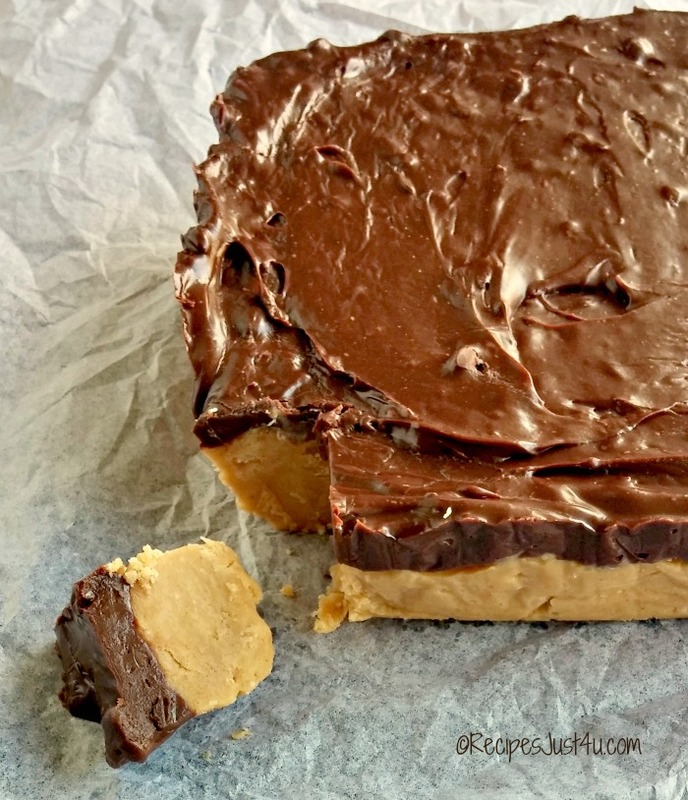 The first layer of this buckeye fudge is made by placing the peanut butter into a microwave safe bowl and combining it with two sticks of butter and a teaspoon of pure vanilla extract. Don’t skimp on the ingredients. Margarine and imitation vanilla extract just won’t do. The flavor will let you down if you skimp, plus margarine has a higher water content so the fudge won’t set as well. This layer comes together so quickly. About 1 minute and a half, swirl it all together and then add the confectioner’s sugar. It makes a thick layer very quickly. If you do it on the stove top, just use a heavy saucepan and cook it over medium low heat. It takes a bit longer but works very well too. Both come together quickly. One reason the fudge does not need high heat to set is because of the powdered sugar. So, you don’t have to worry about this fudge failing on you. LOVE!! I seem to have been a non fudge maker in my past life, since fudge not setting has been a particular specialty of mine. But not this recipe. It is totally fool proof, even if all of your other fudge recipes have failed on you. Are you a failed fudge maker too? Check out my post for tips for making perfect fudge every time. They really do help. Once it has all combined well, spread it out in a foil lined pan that has been sprayed with a non cooking spray. Press it down well and set aside. Tip for the powered sugar: Sift it first. I discovered that just stirring it into the peanut butter gave it a lumpy appearance, and I ended up having to use a whisk and got a big arm workout to get it smooth. The next step is to add 1 1/2 cups of semi sweet chocolate chips to a glass bowl with 7 ounces of sweetened condensed milk. (I used nonfat to make me think that this fudge is diet friendly. It’s not by any stretch of the imagination, but a girl can pretend, right?). Be sure to choose sweetened condensed milk and not evaporated milk. It’s thicker and sweeter, and you need both. 2 tablespoons of butter goes into the bowl and it’s all heated in the microwave for about 90 seconds, stirring now and then. If you do this step on the stove top, you will place the bowl over a pan of simmering water until the chocolate melts. It takes longer and the microwave works so easily so I used that today. Just a few minutes and the fudge layer is done. Would you believe me if I say, “that’s all there is to the two chocolate peanut butter layers?” Well….that’s all there is to it. It’s hard to believe it is done in such a short amount of time. You have a choice now. It will set on the counter top in about 4 hours, or you can chill it in the fridge for faster setting. I put mine in the fridge and it was set and ready to cut in about 2 hours. 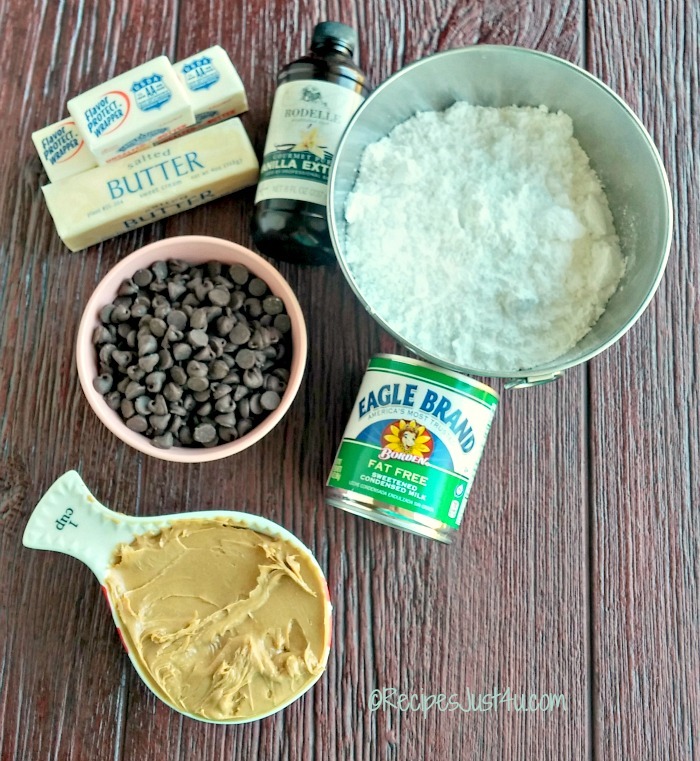 Seriously…easiest fudge ever! 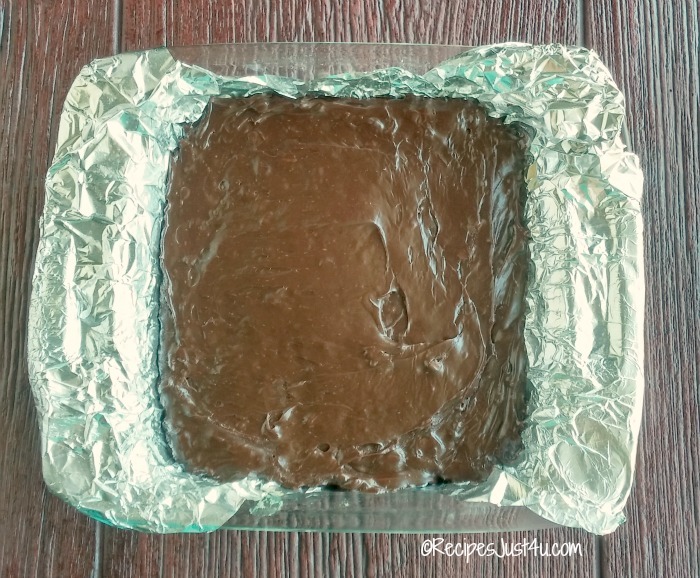 To serve, use the sides of the aluminum foil to lift the fudge out of the pan. Strip away the al-foil and cut it into small pieces. This recipe makes 48 servings. The fudge is very rich. If you want it to go further, use an 8 x 11″ pan and the same ingredients. The slices will be thinner but a small bite is really all that is needed since this buckeye fudge is so sweet. And WHOA…the flavor!!! Rich semi sweet chocolate over a creamy peanut butter fudge base. It’s Buckeye fudge heaven, folks. Better put some aside for gifts, ladies. 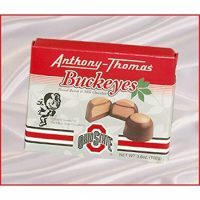 If you keep them around, and you lack Buckeye control, there won’t be any to share with family or friends! This fudge is sure to become a holiday tradition. Your friends and family simply will not believe how easy it is to make! Fudge makes a wonderful home made Christmas gift too. Add a pretty container and give a gift of love! Using a really sharp knife gives you very sharp edges so that the fudge presents better. It’s a good thing I only make fudge once a year. This recipe is not for the diet conscious but it’s worth every calorie! The recipe makes 48 pieces if you use a 9 x 9 inch pan with 148 calories or 7 WW Smart points in each piece. If you use a 9 x 13 inch pan, you should be able to cut 78 pieces taking each piece down to a more respectable 99 calories and 5 WW smart points. 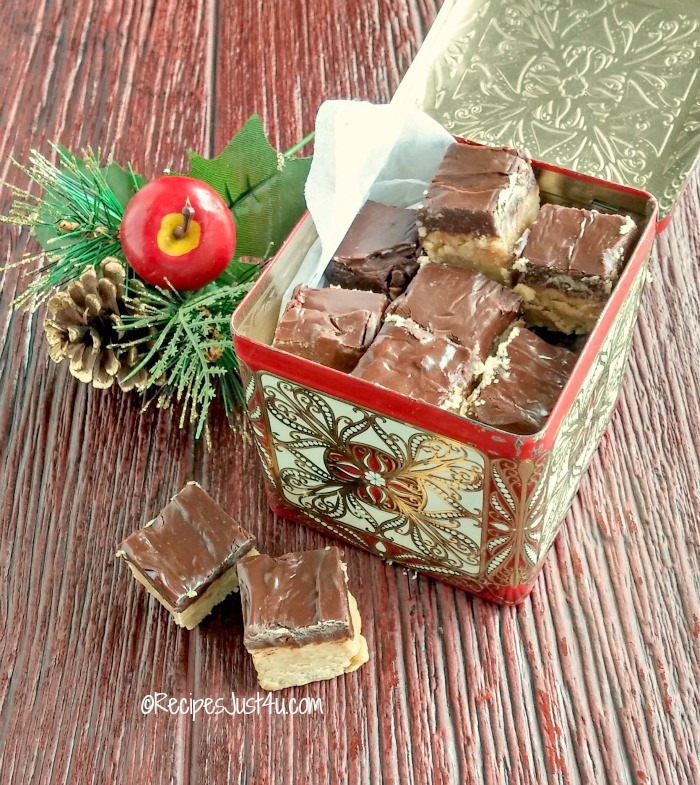 Admin note: This recipe for buckeye fudge first appeared on the blog in November of 2015. I have updated the post to include a printable recipe card, more photos and a video for you to enjoy. 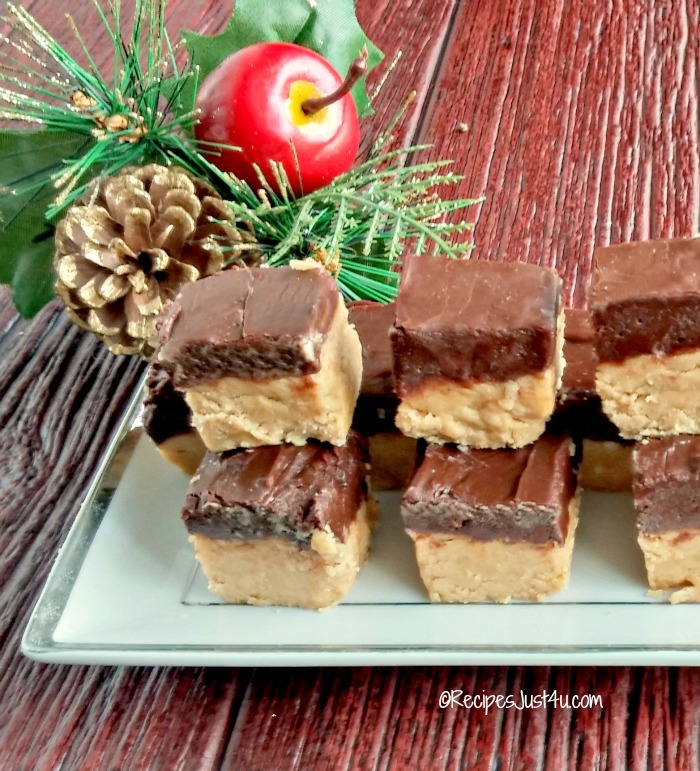 Would you like a reminder of this buckeye fudge recipe? Just pin this image to one of your dessert boards on Pinterst. This buckeye fudge is rich and decadent . 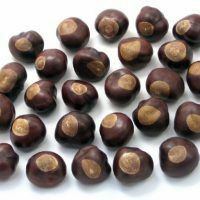 It tastes like buckeye balls without all of the work of making them. 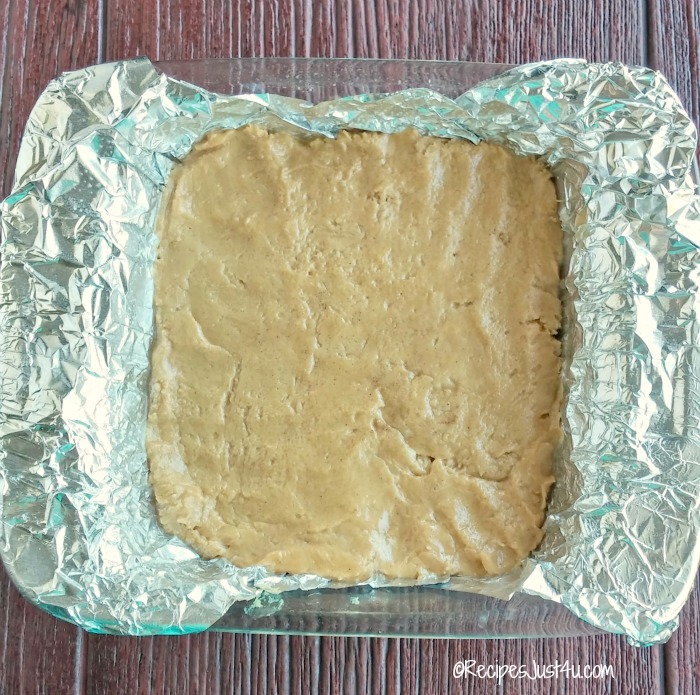 Line a 9 x 9 inch pan with aluminum foil or parchment paper, bringing the edges of the foil up over the sides of the pan to use as handles later to remove the fudge. Spray the foil with Pam cooking spray and set aside. Combine the peanut butter, 2 sticks of butter and vanilla extract in a glass bowl and cook in the microwave for 1 minute. Stir well and cook another 30 seconds or so until everything is well combined. Sift the powered sugar and add it, one cup at a time to the peanut butter mixture, mixing well until everything is very well combined and the mixture is smooth. Spread the peanut butter mixture in the foil line pan and set aside. Clean your bowl and add the chocolate chips, sweetened condensed milk and 2 tbsp of butter. Cook for one minute in the microwave. Stir and continue cooking another 30 seconds. 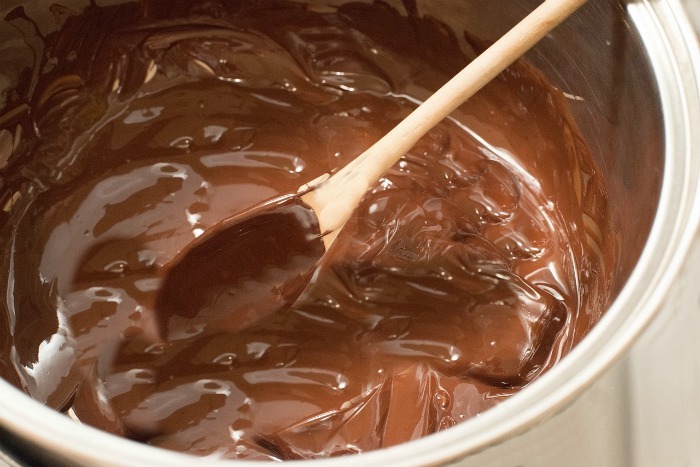 Stir very well until the chocolate is smooth and spread it over the peanut butter layer. Allow the fudge to set for 4 hours on the counter top. You can also put it in the fridge to set a bit more quickly. Once set, cut with a very sharp knife into 48 pieces. Store in an air tight container in the fridge for a few weeks, or freeze to use later. ← Royal Icing For Gingerbread Houses with Just 3 Ingredients! I’m one of the admins over at Collective Yum. I thought that this was the most delicious looking recipe I saw all day today! Thanks for sharing with our readers at Collective Yum! 🙂 Have a good one! What an easy fudge recipe and very similar to one I used to do years ago. I may have to try this for the holidays. And I think I really should sever my internet connection after 9 pm – so that I am not tempted to head to the kitchen and make fudge! OMG this looks fantastic! LOL. This one is worth keeping the internet on for! This looks so amazing! I didn’t know about the higher water content of margarine. This explains so much. I have decided to reduce the chemicals in my life, so “oleo” is out! Thank you for the recipe. I hope to give it a go! These fudge looks yummy! Your pictures are so good that it’s making my mouth water (-; I bet my hubby would love these. Thanks for sharing! Thanks Linda. The fudge is out of this world!